Daniel with his Mahi Mahi! 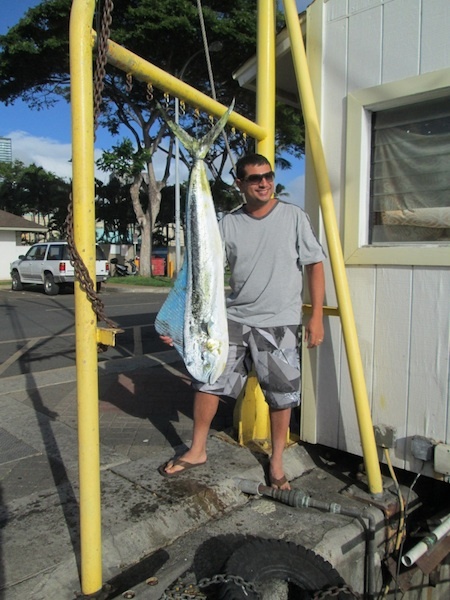 Mahalo to Daniel for choosing Maggie Joe Sport Fishing! He joined us aboard the Sea Hawk on a sport fishing charter. Captain Darryl hooked up with this nice Mahi Mahi and Daniel landed her while deep sea fishing outside of Oahu, Hawaii! Aloha! Adam and Mark with nice female Mahi Mahi! 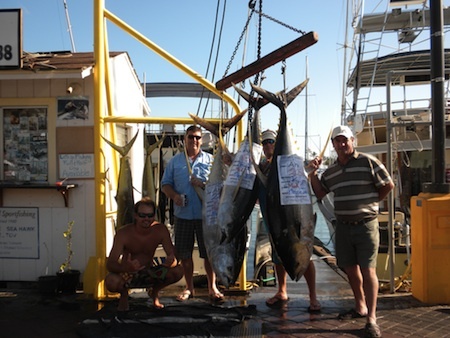 Aloha to Adam and Mark for choosing Maggie Joe Sport Fishing! The guys joined Captain Darryl aboard the Sea Hawk on a sport fishing charter. They caught this nice female Mahi Mahi while deep sea fishing outside of Honolulu, Oahu! Aloha! Mark with his Mahi Mahi! Mahalo to Mark for choosing Maggie Joe Sport Fishing! Mark joined Captain Mike aboard the Maggie Joe on a sport fishing charter. After departing Kewalo Basin, next to Waikiki, they spent a beautiful day out on the water. While deep sea fishing outside of Honolulu, Oahu they hauled in this tasty Mahi Mahi! Aloha! 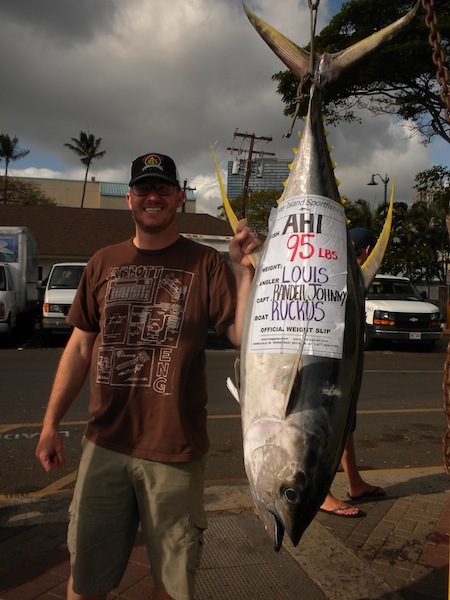 Louis with his 95 lb Ahi! Mahalo to Louis for choosing Maggie Joe Sport Fishing! Louis joined Captain Randell and Deckie Johnny-bobo aboard the Sea Hawk on a full day sport fishing charter. He hauled in this nice 95 lb Ahi while deep sea fishing outside of Honolulu, Oahu! Hana Hou! Lance, Nikki, Jack, Kyle and Tim with 12 Aku and 2 Mahi Mahi! 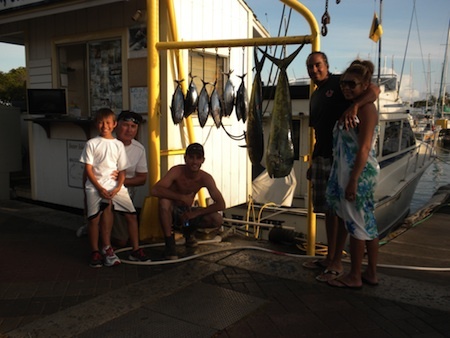 Mahalo to Lance, Nikki, Jack, Kyle and Tim for choosing Maggie Joe Sport Fishing! The group joined us aboard the Ruckus on a sport fishing charter. They hauled in 12 Aku and 2 Mahi Mahi while deep sea fishing outside of Waikiki, Oahu! Aloha! Yudi Sam Lam with 2 Mahi Mahi! 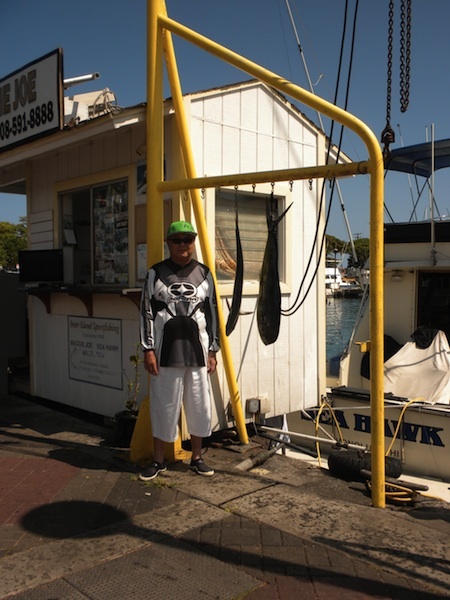 Mahalo to Yudi for choosing Maggie Joe Sport Fishing! He joined us aboard the Maggie Joe on a sport fishing charter. 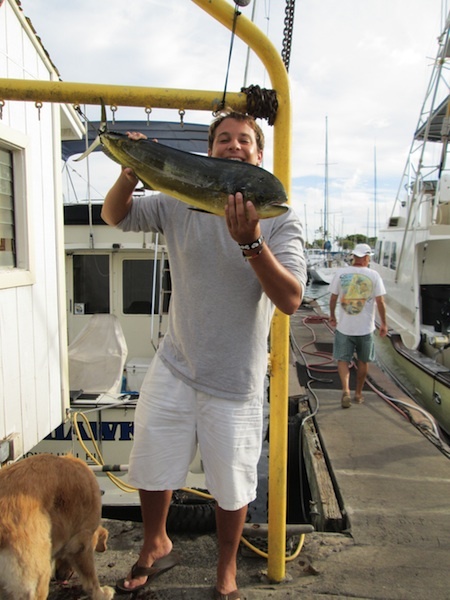 He hauled in 2 tasty Mahi Mahi while deep sea fishing outside of Honolulu, Hawaii! Aloha! Keith, Margie, Jacklyn, Ian, Charles Sr and Charles Jr with catch! 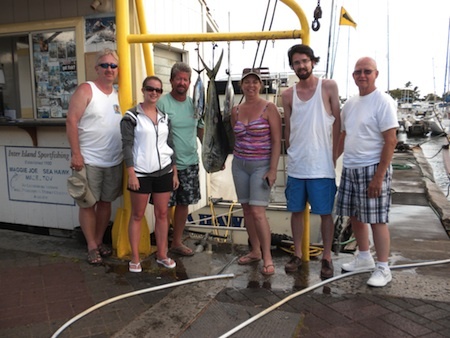 Mahalo to Keith, Margie, Jacklyn, Ian, Charles Sr and Charles Jr for choosing Maggie Joe Sport Fishing! The family joined us aboard the Maggie Joe on a sport fishing charter. While deep sea fishing outside of Honolulu, Oahu they caught this Mahi Mahi and 2 Aku! Aloha! Josh and Chris with their catch! 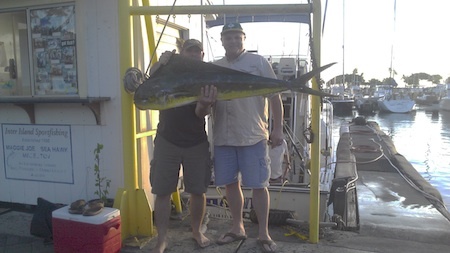 Mahalo to Josh and Chris for choosing Maggie Joe Sport Fishing! The guys joined Captain Mike aboard the Maggie Joe on a sport fishing charter. 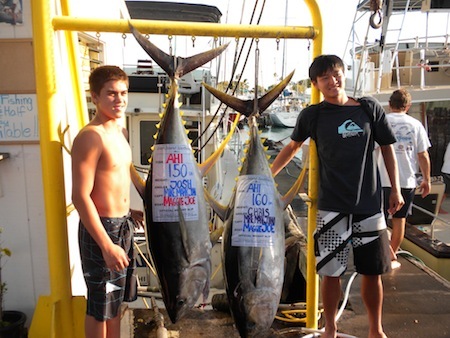 While deep sea fishing outside of Honolulu, Oahu they hauled in these 2 Ahi’s! Mahalo! Charlie, Wayne, Matt, Roku and Mate Jeremy with 110 lb Ahi, a Shibi and a handful of Mahi Mahi! 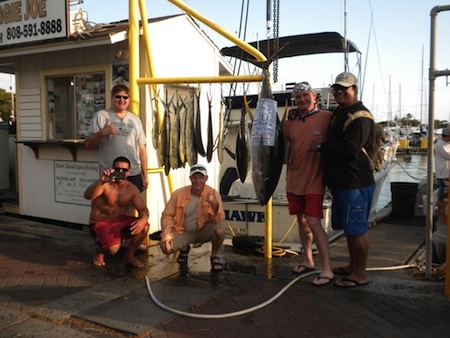 Mahalo to Charlie, Wayne, Matt and Roku for choosing Maggie Joe Sport Fishing! The group joined us aboard the Ruckus on a sport fishing charter. After departing Kewalo Basin, next to Waikiki, they spent the day deep sea fishing outside of Honolulu, Oahu and hauled in a nice 110 lb Ahi, Shibi and a handful of Mahi Mahi! Aloha!